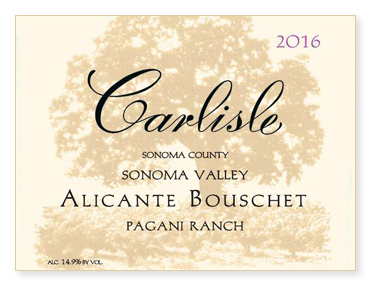 In the last 20 years, we have bottled Alicante Bouschet only three times – 2004, 2013, and now, with this vintage, 2016. While the variety is one of our favorites for blending, providing ample color and adding a bit of complexity, it often falls short as a complete wine. But in these three particular vintages, every component is in place, a beautiful nose, delicious flavors, and a long finish. Aged in all neutral oak and bottled unfined and unfiltered. Black as a moonless night deep in a bamboo forest. (Trust me, that’s black!) Blackberries and boysenberries abound in the deep, concentrated aromas. A touch of dark earth as well. Medium-full to full-bodied with plenty of fresh blackberry, ample acidity and suave tannins. While there is plenty of fruit to this wine, it is by no means jammy thanks to its low pH and high TA. This will age well. Drink 2022 to 2033.